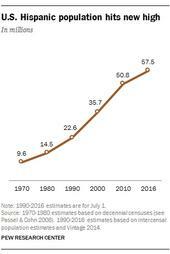 The Latino population in the United States has reached nearly 58 million in 2016 and has been the principal driver of U.S. demographic growth, accounting for half of national population growth since 2000. The Latino population itself has evolved during this time, with changes in immigration, education and other characteristics. 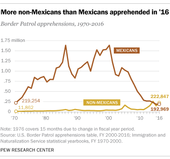 This summary draws on a statistical portrait of the nation's Hispanic population, which includes trends going back to 1980. Here are some key facts about the nation's Latino population. There were 11.7 million immigrants from Mexico living in the U.S. in 2014, and about half of them were in the country illegally, according to Pew Research Center estimates. 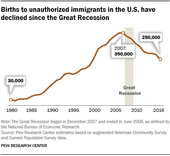 Mexico is the country's largest source of immigrants, making up 28% of all U.S. immigrants. About six-in-ten U.S. adult Hispanics (62%) speak English or are bilingual, according to an analysis of the Pew Research Center's 2013 National Survey of Latinos. Hispanics in the United States break down into three groups when it comes to their use of language: 36% are bilingual, 25% mainly use English and 38% mainly use Spanish. Among those who speak English, 59% are bilingual. About 275,000 babies were born to unauthorized-immigrant parents in 2014, or about 7% of the 4 million births in the U.S. that year, according to Pew Research Center estimates based on government data. This represented a decline from 330,000 in 2009, at the end of the Great Recession. Births to unauthorized immigrants accounted for about one-in-three births (32%) to foreign-born mothers in the U.S. in 2014, according to the estimates.